I find the Saguaro Cactus intriguing. As a kid growing up in the Midwest, I thought this multi-armed cactus was a fabrication of cartoonists. I remember watching cartoons like the Road Runner, Huckleberry Hound, and of course Bugs Bunny. The background contained scenes of red rock, cactus, and the ever abundant tumbleweed….. all foreign to a young gal growing up in Illinois among cornfields. Each saguaro cactus is unique. The ribs and needles appear to form an intricate and complex pattern. It took me weeks of living amongst these beauties before I was even able to pronounce the name saguaro correctly…. pronounced: sah – wah – ro. The saguaro is a large, tree-sized cactus which can grow as tall as 70 feet (20 meters). 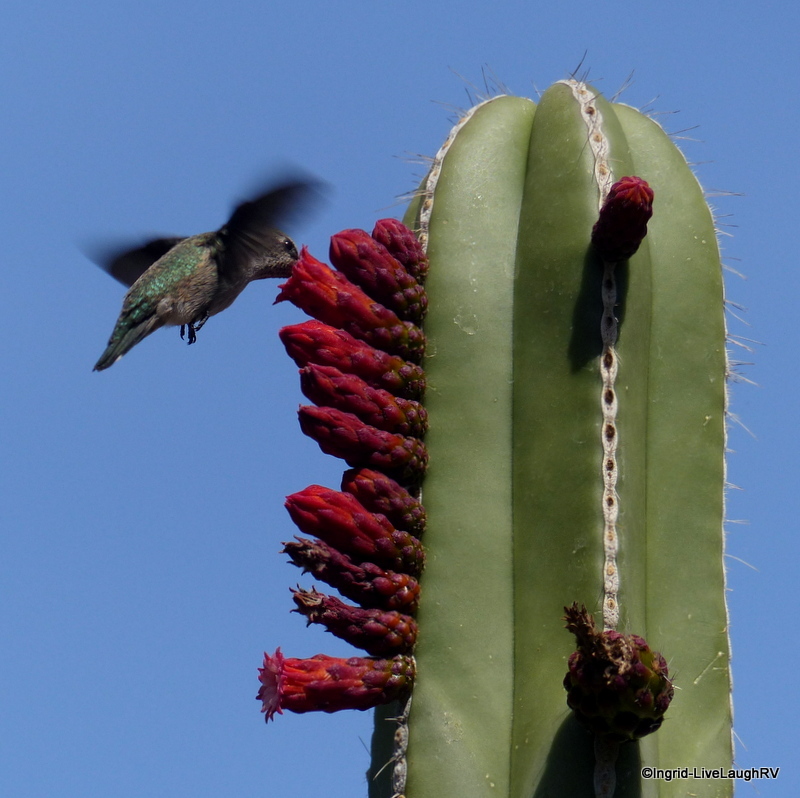 They grace the landscape in all directions in Arizona’s Sonoran Desert. Saguaros have a relatively long life span, averaging 150-175 years of age with some living as long as 200 years. 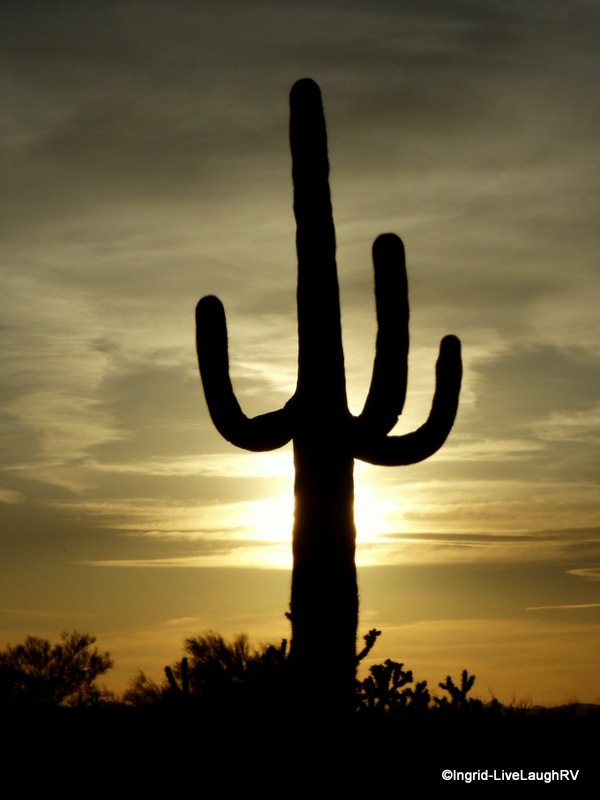 It can take 50 to 70 years for a saguaro to develop a side arm. 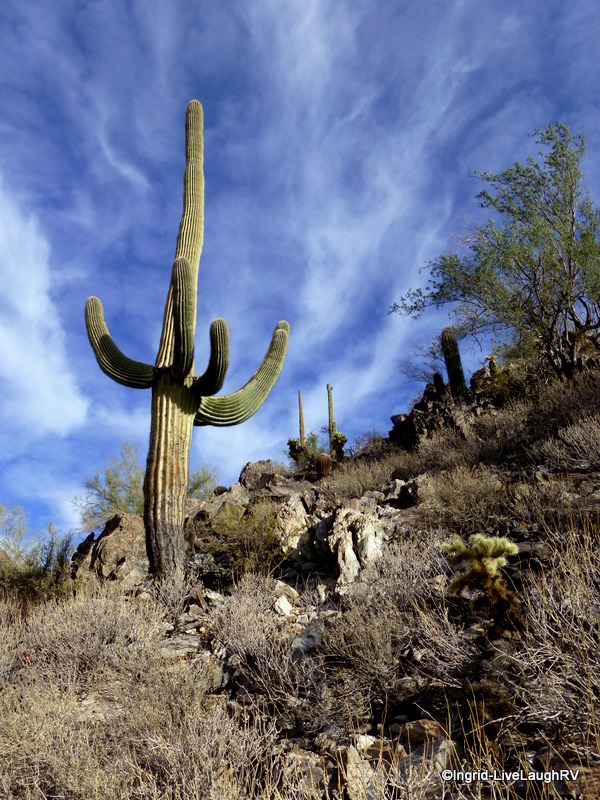 Saguaros are very slow growing and may only grow an inch or two its first eight years. Whenever it rains, saguaros soak up the rainwater and the cactus’ ribs will visibly expand. This might explain why the desert feels so alive after a rainfall. Hubby and I have been hanging around Arizona’s Phoenix valley since the third week in February and have enjoyed watching the desert bloom. One of the reasons we’ve prolonged our stay in Phoenix was for me to see the saguaro bloom. The saguaros are late bloomers and most don’t start until sometime in May. However, they seem to start a little earlier at the Desert Botanical Garden, which of course I found rather exciting. Guess it doesn’t take much to entertain me these days. 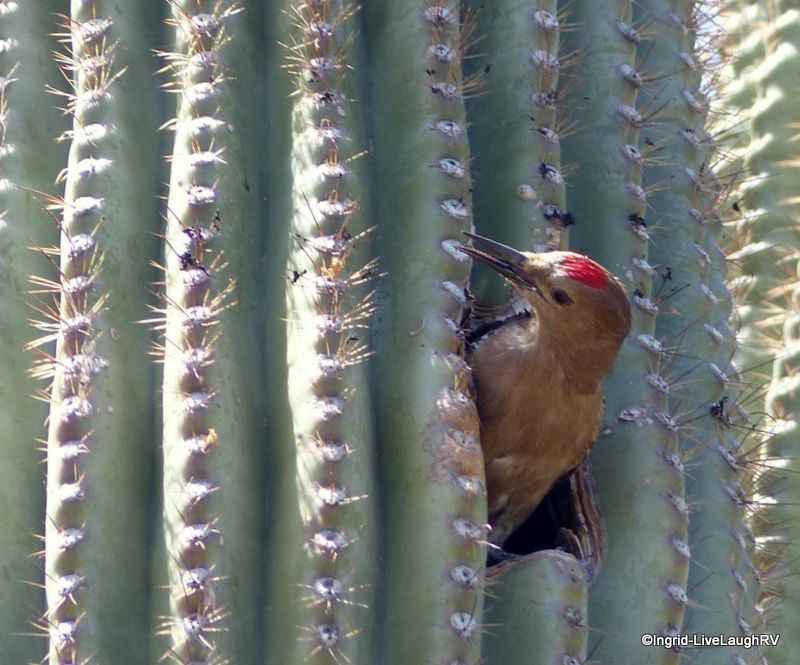 the saguaro provides a home for a Gila Woodpecker. With temperatures hovering in the nineties in Phoenix, Arizona, the saguaro are now starting to bloom in the wild. Most of the other cacti and vegetation are no longer blooming, but I have the fondest memories of the desert in bloom just a few weeks ago. We’ll hang around Phoenix a few more days, then pack up and start our journey toward Colorado in search of cooler temperatures. This post is in participation with the WordPress photo challenge – intricate. 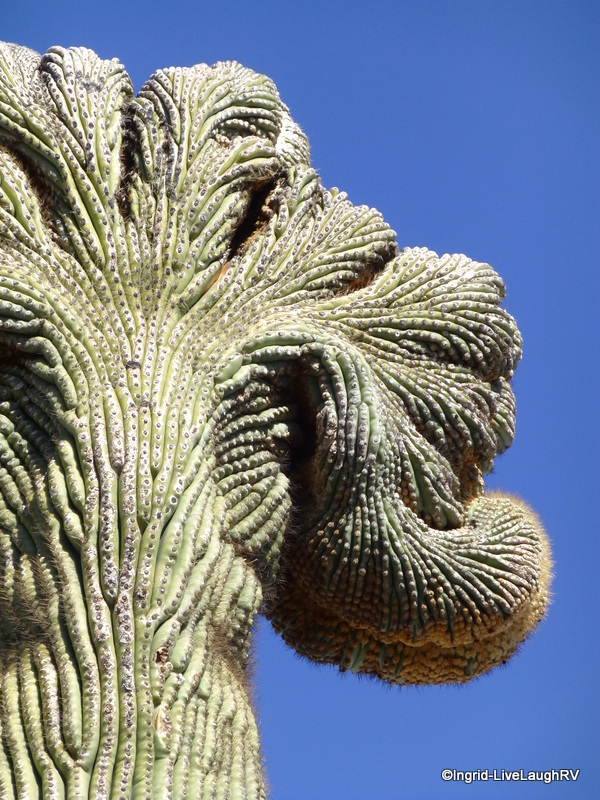 The needles on a cactus provide a complex, detailed, elaborate, and intricate maze. Fascinating plants that are particularly beautiful in the spring. Thank you Jet. If you ever get a chance, you and your partner would love visiting the Phoenix Botancial Garden in the spring. The various blooming cacti are fascinating beyond words. The contrast between the delicate blooms and spiky thorns is quite a sight…. not to mention the wonderful birds. Great capture of the Gila! Great photos, as usual. Interesting facts too. The blooms on the cacti are lovely, I can see why you wanted to stick around long enough to see them bud. Thanks Gayle. Seeing the saguaro bloom was worth hanging around Phoenix a little longer. It’s a unique sight. I was wondering if you had left. 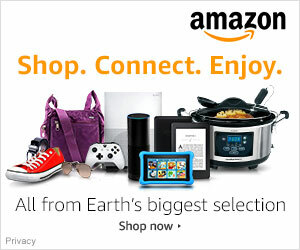 We have been busy going here, there and everywhere! The saguaro are just starting to bloom here in Anthem… I have not seen the crown yet… like I talked about. I am hoping you get to see one. If I see one I am texting you!! Thank you Sheila… looking forward to getting back to CO. Fantastic photos, Ingrid. 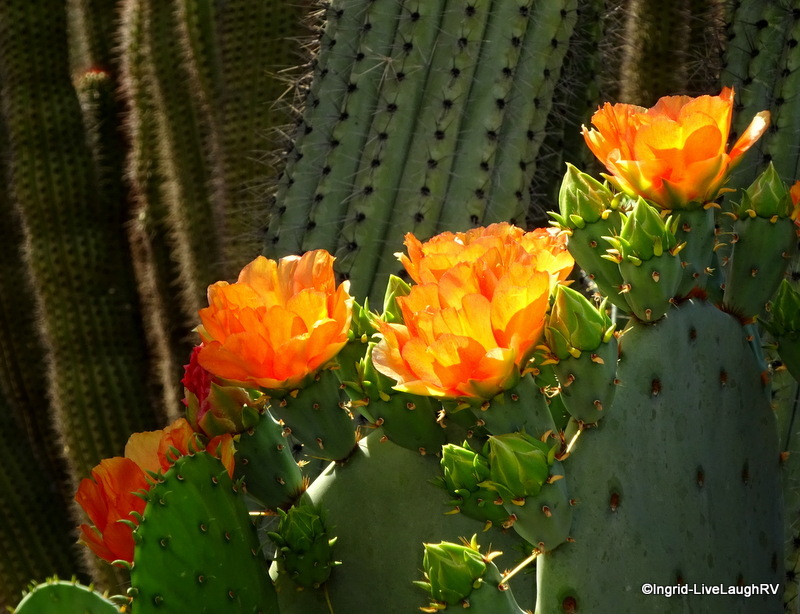 Thanks so much for sharing the saguaros in bloom. I don’t think we will ever get “up close and personal” with them during their blooming season. They are so beautiful. Thanks Marsha. And agree…. they are beautiful. I snapped a few more shots today and we hit the road in the morning. I think in the next couple of weeks they’ll go really crazy blooming but it’s too hot for me to stick around much longer. Thanks…. the saguaros are fascinating to begin with but seeing them with flowers is a unique sight. It’s been worth the extended stay in the warm/hot weather to see them bloom. The cacti are extremely unique and I love the relationship between the plants and the birds. I love the saguaro, too. They have such a magnificent presence. I’ve always wanted to see them in bloom so I’m happy to see your photos. Your crested saguaro is gorgeous! A fascinating plant isn’t it? 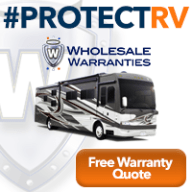 It sure is…. what other plant has a skeleton? How wonderful to be there to see them bloom. I was in AZ for the first time last fall and have dreamt of being there in the spring now your photo’s and information have fueled that desire. Thank You!!! Thanks so much for taking me back to Arizona..I love those rare Crested Saguaros…and those Gila Woodpecker are some of my favs!!! You welcome Donna. I love the coloring of those Gila Woodpeckers. I can see why they’re a fav of yours. You cannot help but be in awe of theses soldiers of the desert. How long they take to grow, the shelter they provide to birds and animals and their overall role to the landscape. Enjoy your time in Colorado, we are headed to Canada for even cooler weather and of course mosquitos! Soldiers of the desert is a wonderful description. We’ll spend June and July in Colorado and then it’s off to IL and WI where I know we’ll encounter plenty of bugs, not to mention humidity…. yikes! I look forward to following your journey and job. They are magnificent, but I’ve never had the urge to hug one. Thanks for these pictures, I love the saguaro cactus and wish we could have stayed until it bloomed! Great captures. I like them a lot. Lovely to see them with flowers, we were there a few weeks ago when it wasn’t quite so hot, but no flowers 😦 and I guess with flowers, come birds. Great shots. There’s an interesting relationship between the birds and the saguaro year round. But the flowers do seem to wait until it’s nice and hot. Thanks for stopping by and commenting. What great photos you captured Ingrid! I am thinking it is time to move north too. So Cal was getting quite warm when we took off, so Phx would definitely not be to my liking right now. I do remember living in Phoenix full-time but I was younger and more resilient. Also, I traveled for work a lot so I was able to escape the heat. I know what you mean about being ready to travel. I have been chomping at the bit for some time. Safe travels! 50-70 years to grow a arm… that is so special These photos are so beautiful! Is it already hot in AZ? We have had mild weather in San Antonio and Austin area. It dropped to 50F from 70s in the morning just a couple of days ago. Leaving CO, move to Texas, Really? That’s exactly what we did, only decades ago. 🙂 A year ago, our daughter moved back to Texas from Seattle due to her job. 🙂 Btw, 82 F highest today. Stunning shots! What a lovely post. I can’t believe how deadly and gentle they can look, in the same time. Very fascinating. Have a great weekend! Thank you and deadly and gentle sums up the saguaro beautifully. Hopefully I’ll snap a few more saguaro blooming before we head out of town. I was amazed at your hugging cacti! You’re brave! Very brave! Great photos. Well, I think there might have been a little camera angle trickery going on. Those thorns are super sharp and me bumping into a few had my husband laughing. Well you sure for me on that! Nice capture of the hummingbird. Next time you are near Tucson, check out the crested saguaro on the U of A campus (in the very oldest portion). It’s the most elaborate crest I’ve seen, and it appears to be very old. Always interesting. Nice post. Great photos, as always. Thanks Judy. I’ll be sure and check out that saguaro at U of A next time through Tucson. The saguaros are such a majestic plant that I’ve come to really enjoy seeing. We visited Tucson a couple of years ago and found these to be just amazing. 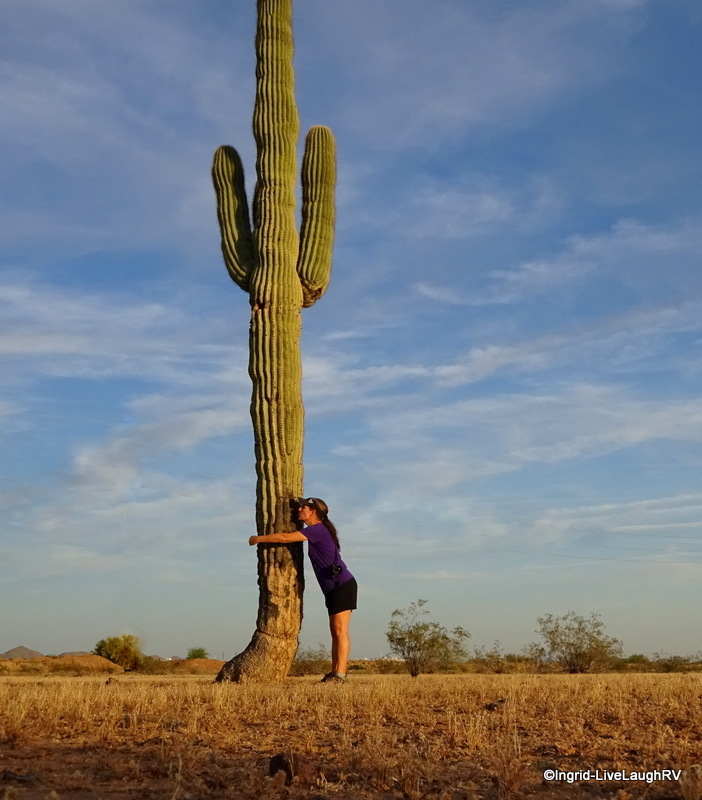 Wow, hugging the cactus; you’re gutsy. Great post. Cheers. Thanks. The forest of saguaros around Tucson is the best. I’d love to visit that area when they are blooming. Love the saguaro photos! You are brave to put your arms around them! Thanks – it was funny trying not to get stabbed by those needles. Can’t say I blame you…. in my silliness I did get too close and got poked…. ouch! Gorgeous pictures! I am currently visiting my new grandson in Phoenix and I am enjoying the beautiful springtime blooms! The Desert Botanical Garden is amazing! Even though I am missing the cherry blossoms in New Jersey, I am considering coming back next year at the same time. Oh how exciting – a new grandson, congratulations. I would encourage you to return late March/early April when most of the flowers our at peak. The Desert Botanical Garden was beautiful when I visited at the end of March and again the second week in April. Brilliant photos, especially those with the birds. Thanks…. it’s so interesting to see the relationship between the birds and these magnificent cacti. 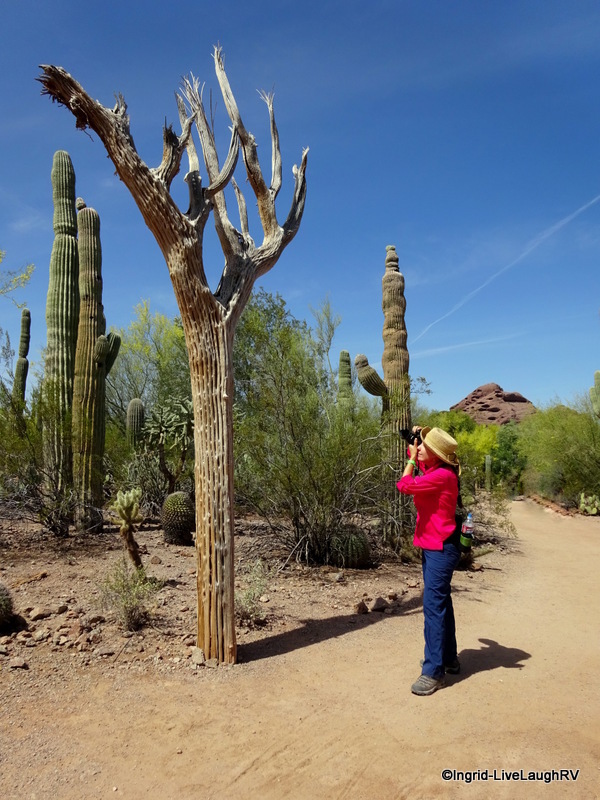 Love, love, love the photos and the Saguaro! Ingrid you taught me a lot in this post and I am especially grateful for the pronunciation lesson. Let’s hope I can remember that. I can see why you would want to stay for the spring flowers. A gorgeous collection of photos. I am afraid I am running out of adjectives to describe these lovely images of yours Ingrid! Ingrid I know what you mean. I did a major re-work on the Statue of Liberty post because it didn’t have enough ‘me’ in it. It’s finding the balance isn’t it? Yep… I know I don’t always have time to read all kinds of stats and can always Google or use a hyperlink if I’m interested in more info. So I try to write as if I’m writing for me. Somewhere along the line I hope to find that balance. Great closeup photography, I really enjoy your work! Love Saguaro too! I see you are a Saguaro hugger! Nice commentary too! 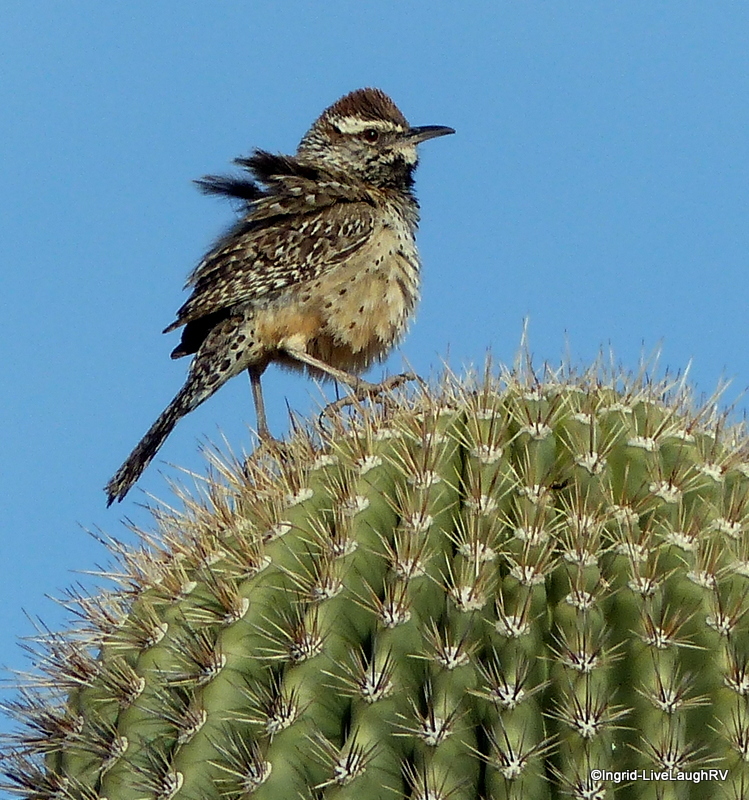 Nice pic on the cactus wren as well. Nice pics as always! Here is a poem I wrote…enjoy! Thanks Wayne. The crested saguaro are always a treat to see. I thought of you Pam as I posted the crested photo. And yes, a pity they wait till May to bloom but they do love the heat…. me, not so much. A few more photos and we’ll hit the road. I’ve also seen “real” Road Runners”, but they moved a little to fast to snap a clear shot. Very nice shots of the cactus. I’m enjoying watching them bloom right now too. We’ll be in Surprise for a few more days before we head back to Northern CA. We won’t be in UT/CO until late summer/fall. I’ve enjoyed our extended desert time. Great choice for the challenge., Ingrid. Thank you. They are such a unique plant. 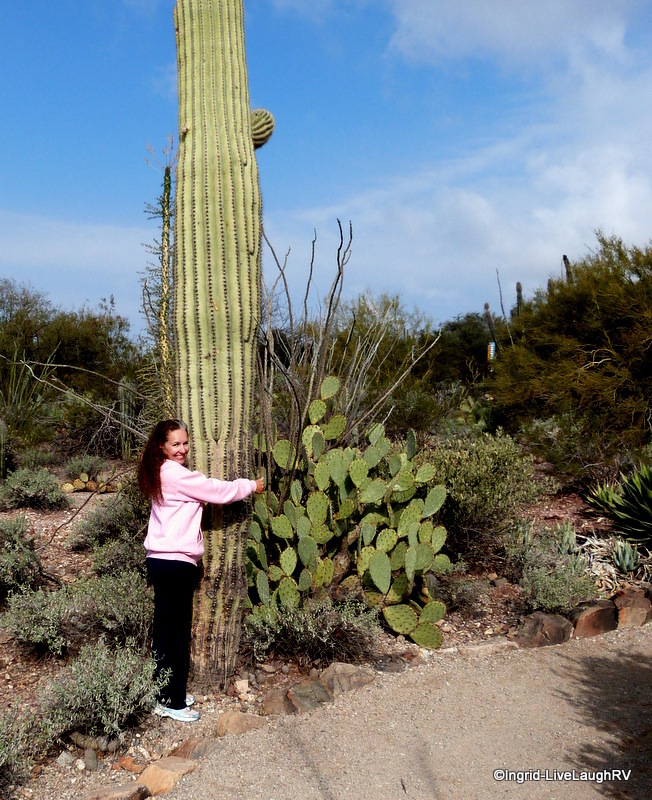 ((SIGH)) I miss the saguaro. I love how each one is unique. Like snowflakes, only better, and warmer.